Last month I waited until six days into the month to share my monthly goals. This month its five days. Let me tell you, life has just been busy lately! Like last month, I’m still seeing the chiropractor three times a week for ongoing care from January’s car accident. I’m hopeful that I’ll be officially released from the car accident soon, or that at the very least my doctor will feel confident in reducing the number of times a week that my back is adjusted. Spending three afternoons a week at the chiropractor since the beginning of February has definitely cut into my weekday workout time. As you all know, I spent the first several days of April still on vacation in Florida, and other than walking around Disney World, didn’t do any other training until after we got back from vacation. Once I got going though, the month of April was a very productive month. Although I didn’t use the elliptical at all last month, I did run and walk a total of 61.3 miles. My 61 miles included three races: the Cherry Blossom Ten Mile Run, the Jaguar 5k, and the Manassas Runway 10k. Some nights I was much better about this than other nights. There were plenty of nights that I fell asleep on the couch watching TV. I really need to be better about just going to bed when I feel tired. Other than the first week of the month, I was routinely able to weight train twice a week. I’ve definitely felt stronger as a result. With yesterday marking the start of my half marathon training for Rock ‘n’ Roll Virginia Beach, I want to spend May trying to ensure that I get all of my training miles in, while also continuing to balance that with other things going on in life. 1. Run, walk, and elliptical at least 70 miles. As I move ahead in my half marathon training, I need to focus on slowly increasing my mileage. Between AP testing, state testing, and other end of the school year activities, May and June are the two busiest months of the school year. Add in lots going on in our personal lives, and that makes for a very busy period of time. If I’m overwhelmed, stressed, or just plain tired, I need to recognize when its better for me to take extra rest than to push forward with my training. Since I didn’t use the elliptical at all last month, I want to focus on reincorporating the elliptical back into my cross training routine. Glad to see that you’re moving forward with your goals! I hope you get cleared from therapy soon! Good job keeping with your goals!!!! Hope you are on the road to healing soon! I’m with ya on getting enough sleep….it’s a tough goal to keep up with! I hope the chiropractor is helping you! My husband is a chiropractor (officially now after 3 years of school, yay! ), and I’ve really come around to all the benefits from getting adjusted! 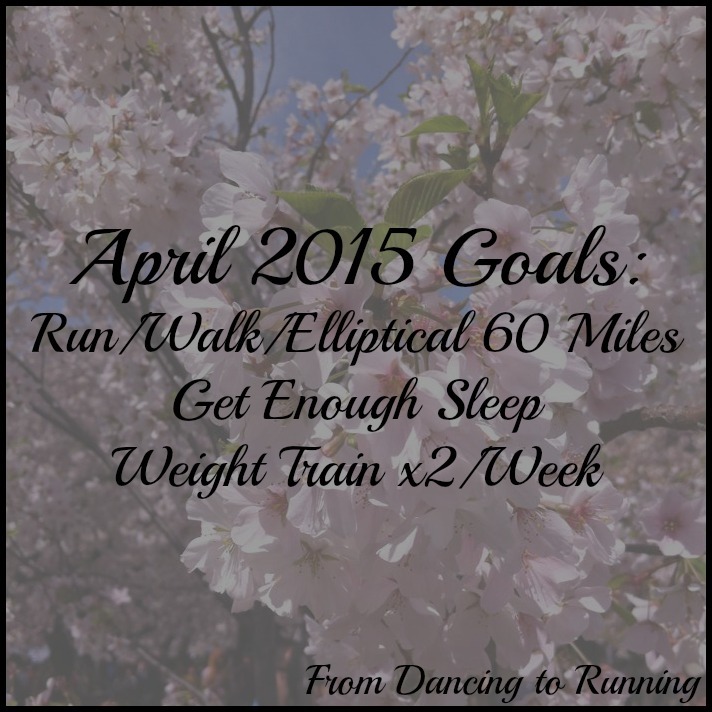 My goal is to walk at least 5x a week until I can (hopefully) pick back up with running toward the end of the month. I’m hoping to get cleared to run at my OB appointment before Memorial Day after my C-section! I’m definitely in a lot less pain than I was after the accident, and its without the use of drugs. Yay! Taper and recovery are definitely important as your distance gets longer and longer. Sleep always seems to be one of the first things pushed to the wayside. I like this working out of the goals in the blog~ I don’t ever set these type of set things to work towards in quite this way- I think it helps you round out your plan- I may have to try this! I definitely find it helpful for helping to keep myself accountable. These sound like great goals!! Hope all is well with the chiro and you can be released soon! Great job with your goals Kathryn. I know you just started training for Rock n Roll Va Beach. Hopefully this summer won’t be super hot and training won’t be too bad! Here’s to lower heat and humidity this summer. Great goals for sure. Sometimes when I’m super stressed, I still need a quick run but I’ll cut it short to make sure I have time to handle everything else. I can’t believe it’s May and yet the university I work at is steam rolling towards finals. It feels like 2015 just started, doesn’t it? hoping you can hit your goals during the last couple hectic months of the school year! what do you normally do during the summers? some of my teacher friends travel, others just stay home and recharge for the fall and i know a couple who run summer camps/etc. what’s your plan this summer? A combination of travel and working on projects for my school district. The extra income is definitely nice to have over the summer. I face the same struggle, yet I’ve never trained for a marathon. These look like great goals for the month – great job last month!! Sounds like you have a busy time ahead but knowing that now will give you time to readjust and plan for day to day activities! Thanks Anna! Maybe you’ll find goal setting to be helpful. I certainly do. Great goals! Keep it up! My goal for this month is to workout at least 5 to 6 times a week and strength train 2 to 3 times/wk. Good luck this month – I hope the end of the year is not too stressful for you. 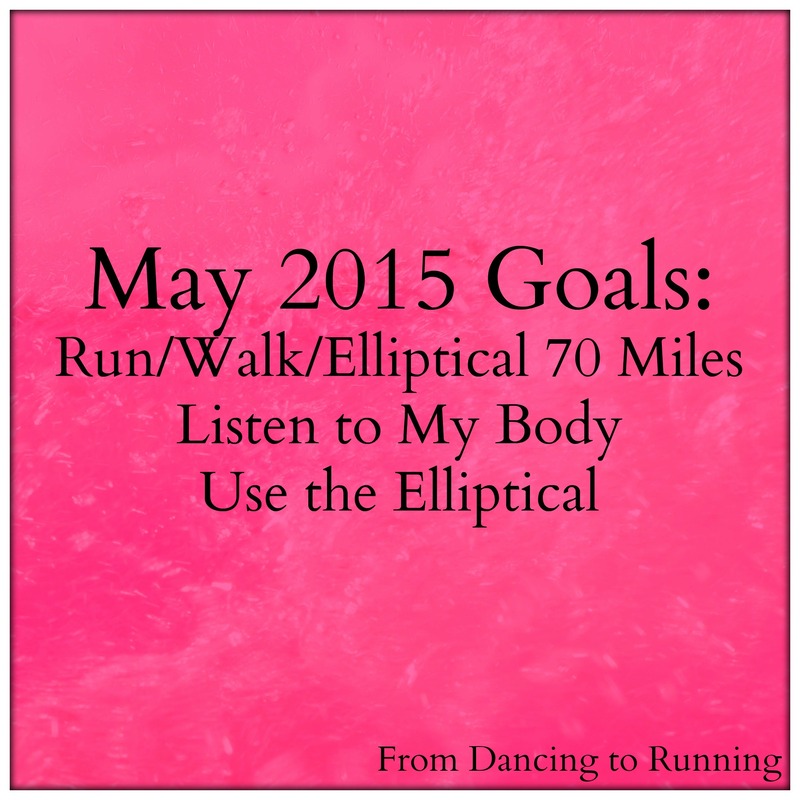 When looking back at my April numbers, I realized I did not incorporate much elliptical either – interesting since I love it! Good job on the April goals! One of my May goals will be to lift about 2x a week, whether it’s at home or at the gym, I really need to be more consistent with it. Consistency is definitely something I struggle with too. Balance is always a tricky thing. Unless you count my weekly workout calendar no goals is working for me right now so I’m sticking with it for May. Kathryn you’re doing such a great job with your monthly goals. Keep it up!